The Hamilton Val-U-Pack iPod/CD/SD/USB/MP3 Listening Center includes everything you need for classroom audio for up to 6 students at a time at a great price. •The HB-100i Portable Boom Box offers the latest digital media capability including iPod docking, CD player, USB port, SD card slot and AM/FM radio. 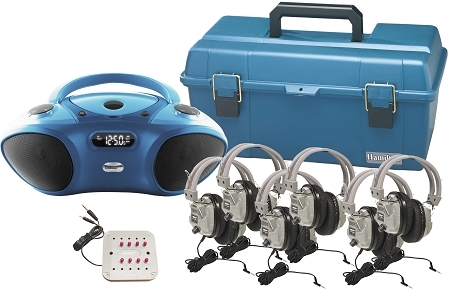 This boom box features everything you need for classroom use; it is designed and built to withstand the rigors of classroom use while providing high quality sound.